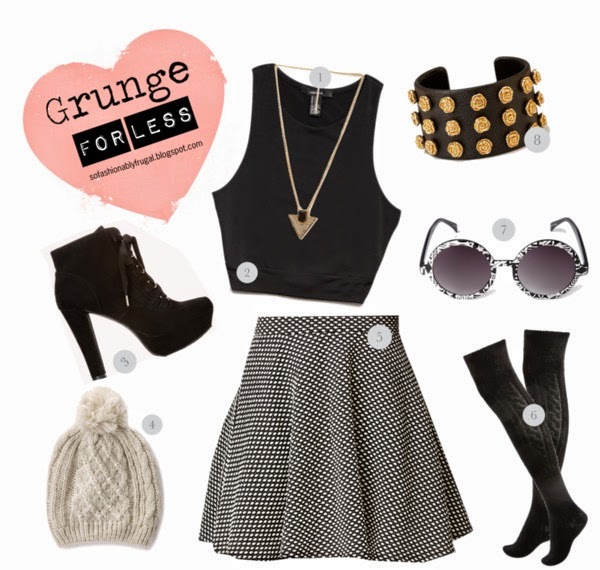 Being a child of the 90's, I was beyond floored when I heard that grunge fashion was back! The 90's were amazing. Cartoons weren't super edited to make parents happy and artists like Nirvana came into the picture. You could go to school looking like you got out of bed and be in style! Don't forget that we could play baseball in the street. Now you never see that happen. If I could go back for a day i absolutely would! Anyone else wanna come with me when I figure out how to? Hmm? So..because of all that, I thought it would be fun to make a set of my favorite grunge pieces out right now. That is, all the ones we can buy for less! Grunge is an easy look to pull off. Never look too put together. If you do, add something that you would never think to put with your outfit. For example, a nice dress with combat boots. Or in my set above, a random snow hat. Remember, grunge is about a few things. Dark florals, velvet textures, plaids plaids and more plaids, chunky shoes and hats (usually bowlers or beanies). Oh, and I don't recommend this look AT ALL for work or formal functions! Find Your Cozy/Chic Sweater For Fall! How to Shop Thrift Sales!